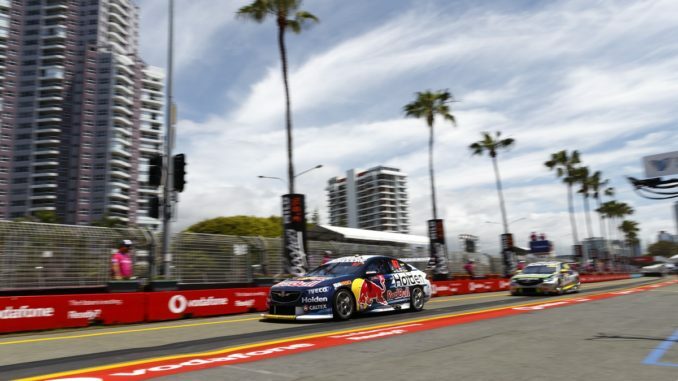 The Virgin Australia Supercars Championship battle between Shane van Gisbergen and Scott McLaughlin went to another level on the streets of Surfers Paradise at the Vodafone Gold Coast 600. 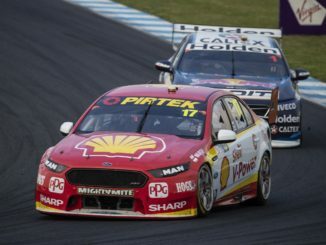 McLaughlin had promised to turn the heat up on the points leader this weekend and certainly did that in what might have been mistaken for a qualifying session, rather that practice. 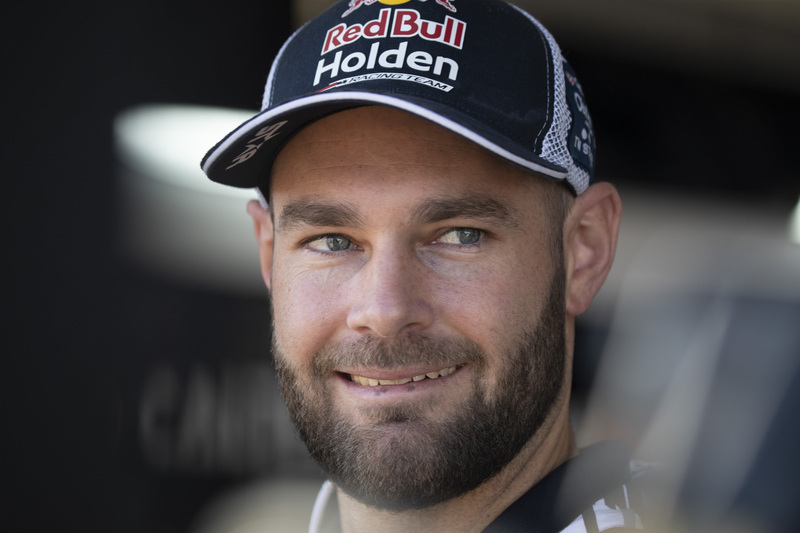 Van Gisbergen took the honours from McLaughlin by less than a tenth of a second with Fabian Coulthard third in the twin Shell V-Power Falcon with Jamie Whincup, in the sister Red Bull Holden, in fourth. Bathurst winner Craig Lowndes was fifth in the third 888 Commodore. McLaughlin and Whincup alternated between first and second through the session. It was a repeat of their dual from last season which famously went down to the wire at the last race in Newcastle. But Van Gisbergen spoilt the party leaving Whincup and McLaughlin to make up the placings while still swapping positions lap after lap. McLaughlin saved the best until last to jump back to the top but Van Gisbergen went one better after the flag had dropped. “It was intense,” McLaughlin said. We are having a massive crack at it, me and him. In that first session we were going hard at it, he was whacking mirrors, I was whacking mirrors. Rick Kelly, who was fastest in first practice, ended up seventh in the Nissan while Chaz Mostert finished eighth. David Reynolds fought back from his Bathurst heartbreak with a solid performance to come in ninth. Will Davison halted the last session when he lost a wheel and ended up in one of the notorious Gold Coast walls in the Milwaukee Falcon, outing he and his brother Alex out of the session. The session was immediately faster than the previous two as drivers laid down their flying laps. 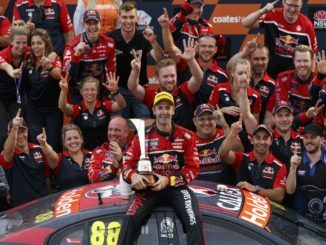 Whincup was the first to break into the 1m:10s barrier with Courtney, who has always been fast on his home track, the next. Preston Hire Racing’s Lee Holdsworth was quick after a forgettable year this far for the team, slipping into third before the red flag came out. He finished sixth behind Lowndes. The Surfers Paradise circuit claimed another victim when Richie Stanaway slid sideways into a wall causing severe damage. He was able to limp home but his day, too, was done. Action on the track goes up a notch tomorrow when ARMOR ALL Qualifying begins at 10:05am AEST followed by the Top Ten Shootout at 11:25am which will decide the starting grid for tomorrow afternoon’s opening 300km race of the weekend, which begins at 2:25pm AEST.